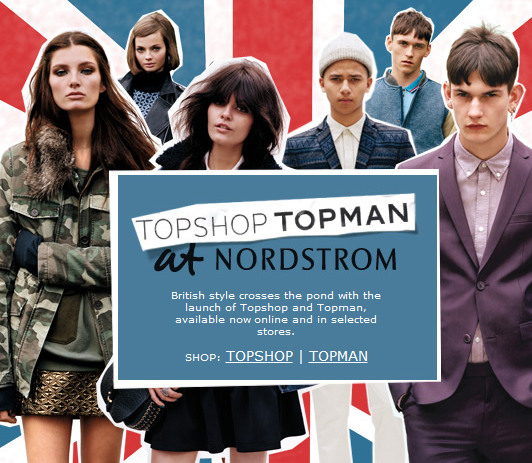 The British really are coming, to Nordstrom. In fact they are there now. I'm talking about Topshop! Both brands are on sale on Nordstrom.com and in select stores. This is good news for those of us who like Topshop in the United States. Until now, US Shoppers have only been able to get Topshop online, at the Soho store or at Fred Segal in Los Angeles. Now with Nordstroms, Topshop fashions are available all US shoppers. You can see the offerings already on Nordstroms.com. Since Topshop carries different brands, that means sizing is not uniform. This makes it a real benefit to be able to now visit the store to try things on. Even more exciting, I hope to see Topshop on the Nordies sales and at their Rack stores. Right now, Topshop is only available in -store at 15 Nordstroms in the US. But you can order from Nordstrom.com if there is no store in your area. 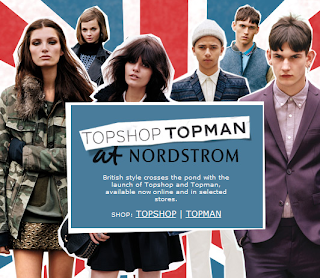 Click here to view TOPSHOP and TOPMAN online at Nordstrom. For a limited time, get free shipping and free returns on every order.